Tag Archive | "bill warner pi"
Foreclosure Law Office of David J. Stern Cash's in On Foreclosures And Goes Global On The NASDAQ With "Chardan 2008 China Acquisition Corp". Foreclosure Law Office of David J. Stern Cash’s in On Foreclosures And Goes Global On The NASDAQ With “Chardan 2008 China Acquisition Corp”. Chardan 2008 China Acquisition Corp. (CACA, CACAW, CACAU) signed a definitive?agreement for a business combination with DAL Group, LLC, a provider of processing services for mortgage lenders and servicers in Florida. At the closing of the business combination with Chardan, DAL will own 100% of the business and operations of Default Servicing, Inc. and Professional Title & Abstract Company of Florida and the non-legal operations supporting the foreclosure and other legal proceedings handled by the Law Offices of David J. Stern, P.A., collectively known as the Company. For the six months ended June 30, 2009, the company, DJSP Enterprises, generated revenue of approximately $117 million, EBITDA adjusted on a pro forma basis of approximately $35 million and net income adjusted on a pro forma basis of approximately $22 million. So, Mr. Stern, how does the ‘foreclosure mill” of the David J. Stern law office net $49 miilion in 2009 when you bid on and obtains”bundles” of foreclosures from Wells Fargo Bank or Deutsche Bank and process’s each foreclosure for a flat fee of $1,400 which covers the cost of an associate attorney, processing, service of complaint, office help etc.? I know for a fact that the cost of processing a Foreclosure Complaint has increased since 12th Judicial Circuit Chief Judge Lee Haworth stopped Attorneys “calling in” on Foreclosure Complaints in 2009 and forced Stern Associates to actually drive from Plantation Fl to Bradenton or Sarasota to appear in person. “The area’s top judge has lost patience with so-called foreclosure mills so he’s ordering them to appear in court. Non-local law firms that specialize in mass foreclosure filings have ignored local court procedures, filed incomplete or inaccurate court documents and “widely abused” the privilege of appearing at court hearings by telephone, 12th Judicial Circuit Chief Judge Lee Haworth said. He’s cracking down, requiring lawyers in foreclosure cases filed in Manatee, Sarasota and DeSoto counties to attend all foreclosure-related hearings in person”. The companies listed as Delaware Corporattions and DJSP ENTERPRISES, INC (except DAL Group LLC) above are all Florida Foreign Corporations linked directly to the David J. Stern Law Ofice in Plantation Fl. The David J. Stern Law Office and one of it’s process serving companies “Provest” have been sued in Conn for falsifing court documents, claiming the initial Complaint was served on the correct owner of the Florida property when in fact it never was, another case of “sewer service“. A “John Grisham Novel” has nothing on the activities of the David J. Stern Law Offices. SEE.. CONNECTICUT MAN FILES MASSIVE LAWSUIT AGAINST DAVID J. STERN LAW FIRM & ATTORNEY KARINA MUSELLA OF PLANTATION FL FOR ILLEGAL FORECLOSURE. ALSO SEE.. THOUSANDS OF HOMEOWNERS ARE ILLEGALLY FORECLOSED ON BY DEUTSCHE BANK, IN FLORIDA LAW OFFICE OF DAVID J. STERN LEADS THE PACK, FBI IS INVESTIGATING ! SEE.. ATTORNEY FOR DAVID J. STERN LAW OFFICE IN MONTHS LONG FLORIDA BAR INVESTIGATION HAS BEEN FIRED OR RESIGNED, SARASOTA JUDGE AND US ATTORNEY TAMPA SUGGEST LEGAL ACTION AGAINST STERN LAW OFFICE IN BOTCHED FORECLOSURE CASE. SEE.. 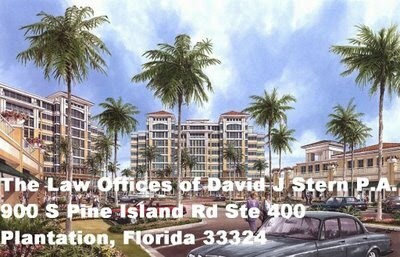 The Foreclosure Mills of Florida led by The David J. Stern Law Offices. SEE.. Kelly Holsopple Was A Stripper And Prostitute in Minneapolis Now A Member Of The Florida Bar & Associate Attorney For A Foreclosure Mill In Plantation Florida Screwing Homeowners, she also has a real estate license in Florida and works for an International Real Estate company. India Infoline News Service, Mar 20, 2010. DAL Group completes business combination with Chardan 2008 China Acquisition Corp. The principals of FlatWorld Capital in Hyderabad and New York and DAL Group worked over the last two years to develop a long-term strategic plan with management and entered into a letter of intent with DJSP in 2008….DJSP is David J. Stern Processing. 5). ATTORNEYS’ TITLE AGENCY, P.A. 6). LAW OFFICES OF DAVID J. STERN, P.A. 7). STERN HOLDING COMPANY – PT, INC. The principals of FlatWorld Capital in Hyderabad and New York and DAL Group worked over the last two years to develop a long-term strategic plan with management and entered into a letter of intent with DJSP in 2008, subsequently contributed the letter of intent to DAL Group, LLC in May 2009 and consummated the transaction on January 15, 2010. DJSP, is David J. Stern Processing, is the largest provider of processing services for the mortgage and real estate industries in Florida and one of the largest in the United States. The Company provides a wide range of processing services in connection with mortgages, mortgage defaults, title searches and abstracts, REO (bank-owned) properties, loan modifications, title insurance, loss mitigation, bankruptcy, related litigation and other services. The Company’s principal customer is the Law Offices of David J. Stern, P.A., whose clients include all of the top 10 and 17 of the top 20 mortgage servicers in the United States, many of which have been customers for more than 10 years. The Law Offices of David J. Stern, P.A., Company has approximately 1,000 employees and contractors and is headquartered in Plantation, Florida, with additional operations in Louisville, Kentucky and San Juan, Puerto Rico. The Law Offices of David J. Stern, P.A., Company’s U.S. operations are supported by a scalable, low-cost back office operation in Manila, the Philippines that provides data entry and document preparation support for the U.S. operation. The Law Offices of David J. Stern, P.A., Company generated revenues of approximately $260 million and adjusted net income of $45 million for the twelve months ended December 31, 2009. Foreclosure Mill Law office of David J. Stern is now DJSP Enterprises, Inc. “DJSP” (David J. Stern Processing)…their revenues increased from approximately $116 million in 2007 to an estimated $259 million in 2009; EBITDA adjusted on a pro forma basis increased from approximately $44 million in 2007 to an estimated $68 million in 2009; Net Income adjusted on a pro forma basis increased from approximately $28 million in 2007 to an estimated $43 million in 2009. So how does the ‘foreclosure mill” of the David J. Stern law office net $49 miilion in 2009 when they bid on and obtain “bundles” of foreclosures from Wells Fargo Bank or Deutsche Bank and process’s each foreclosure for a flat fee of $1,400 which covers the cost of an associate attorney, processing, service of complaint, office help etc.? I know for a fact that the cost of processing a Foreclosure Complaint has increased since 12th Judicial Circuit Chief Judge Lee Haworth stopped Attorneys “calling in” on Foreclosure Complaints in Feb. 2009 and forced Stern Associates to actually drive from Plantation Fl to Bradenton or Sarasota to appear in person. Chardan 2008 China Acquisition Enters Into Business Combination With DAL Group, David J. Stern Law office, DJSP Enterprises, Inc – Update gone public on the NASDAQ. Chardan 2008 China Acquisition was run by Kerry S. Propper he has had some problems with the SBA and the Department of Justice as did his father Dr. Richard D. Propper. Kerry S, Proper, Richard D. Propper and Royale Holdings own 1,151,128 shares of Chardan 2008 China Acquisition, they are the majority share holders of the company now directly linked to David J. Stern and DJSP Enterprises, Inc.
Foreclosure Mill in Plantation Fl run by David J. Stern Law office (DJSP Enterprises, Inc)., just recently went Public on the NASDAQ, David J. Stern has 1/3 ownership of the stock with Kerry S. Propper 1/3 and “Royale Holdings 1/3. Richard Propper father), a physician and venture capitalist who had started an array of businesses, including Medibuy.com, a Website for marketing medical supplies. Propper subsequently launched two more bulletin-board-traded SPACs — Chardan North China Acquisition (CNCA) and Chardan South China Acquisition (CSCA). He serves as chairman of the former and chief financial officer of the latter. Propper is head of Chardan Capital, a San Diego-based venture capital firm. His son Kerry S. Propper, who is an executive at both SPACs, heads the similarly named Chardan Capital Markets, a New York-based broker-dealer and investment?bank. That suit is running parallel to a civil action filed by the SBA in early 2005. In that action, the government alleges the same plaintiffs (Kerry S. Propper) funneled SBA money through Acorn Technology Fund, a small-business investment company, to their own?companies. Among other things, it contends that Propper loaned money to Acorn to finance Medibuy, that Acorn repaid him with SBA money, and that Propper-related partnerships received more than $800,000 from Acorn. In June, Torkelsen began serving a 70-month prison sentence after pleading guilty to making false statements to the SBA. As for Origin, Propper still does shareholder-relations work for the company. In an answer to e-mailed?questions from Barron’s, Origin’s chief financial officer, Jeff Wang, declined to comment on the stock-price decline or the litigation, other than to state that Origin isn’t named. David J. Stern with DJSP Enterprises, Inc., recently went Public on the NASDAQ, David J. Stern has 1/3 ownership of the stock with Kerry S. Propper 1/3 and “Royale Holdings 1/3.